It is tuned in the minor pentatonic scale like the Native American flute and the Japanese flute, although you can also play the major scale. 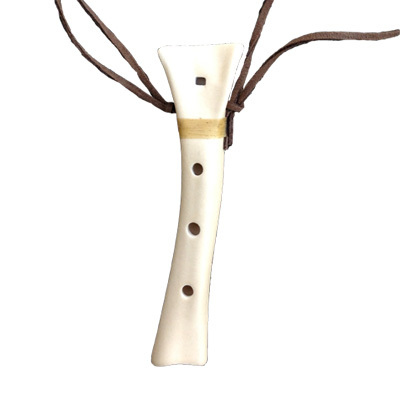 This flute is modelled in clay from the leg bone of the Harpy Eagle, the largest and most powerful Eagle in the world. It is tuned in the minor pentatonic scale like the Native American flute and the Japanese flute, although you can also play the major scale. Indigenous people from around the world have made sounds from Eagle Bones for a variety of purposes, including signaling, ceremony, invocation, prayer, and entertainment. The oldest surviving instrument in the world is a bone flute! *In keeping with its native roots, a songbook is not included with this instrument - music is meant to be played from the heart*.